SEOUL, Dec. 26, 2011 -– LG Electronics (LG) announced today that its newest collection of 3D glasses, including a pair designed by renowned eyewear designer Alain Mikli, will be introduced in the first quarter of 2012. The new 3D glasses — the F310, the clip-on F320 and the Alain Mikli F360 — are lighter and more comfortable to wear while upgraded design features such as curved lenses and clean frame structure have transitioned 3D glasses from burdensome requirements to stylish fashion accessories. The F310 is characterized by a distinctive design that combines soft lines within a slim frame. Unlike many previous 3D glasses, the lenses have been curved to better accommodate the shape of the wearer’s face, as well as to improve the overall CINEMA 3D viewing experience. The F310 weighs a mere 13.5 grams, making it 20 percent lighter than LG’s previous design. Another new item for 2012 includes the clip-on F320. Clip-on 3D glasses are unique to 3D TVs based on Film Patterned Retarder (FPR) technology, which is at the heart of CINEMA 3D TV. Compared to the previous generation clip-on 3D glasses, the F320 weighs 25 percent less at 5.5 grams. Developed in collaboration with Alain Mikli, the F360’s half-rim frame design is sportier and only weighs 16 grams. The lenses of the F360 have been curved and cover most of the wearer’s face, deepening the immersive CINEMA 3D experience. The stylish F360, as well as all 3D glasses from LG, can also worn in theaters showing 3D movies since both CINEMA 3D and theaters utilize the same FPR and RealD technologies. LG’s share of the global 3D TV market increased from 7.6 percent during the first quarter of 2011 to 14 percent by September. FPR’s unobtrusive technology played a key role in the company’s success in 3D TVs, as uncomfortable and expensive glasses have been identified in numerous studies as being the number one reason consumers have been reluctant to adopt 3D in the home. LG plans to continue the success it saw this year by sponsoring a series of 3D film and gaming events in 2012 in order to introduce the CINEMA 3D experience to thousands of participants and visitors. SEOUL, Dec. 27, 2011 –- LG Electronics (LG) will unveil its newest Smart TV features at the Consumer Electronics Show (CES) in Las Vegas next month. Imbedded in the new CINEMA 3D Smart TV line-up for 2012, LG is aiming to provide CINEMA 3D Smart TV owners with the most comprehensive yet easy-to-use home entertainment experience possible, as evidenced by the over 1,200 apps, growing quantity of premium content services and the new Magic Remote. 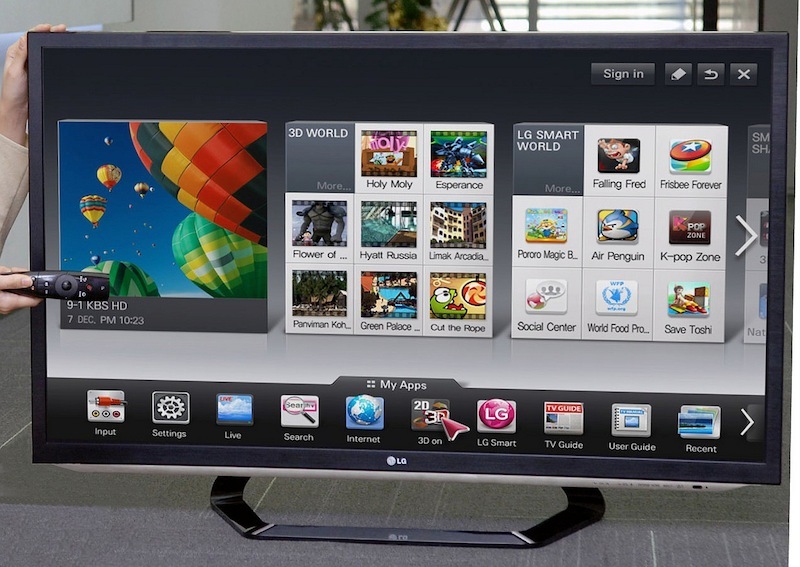 LG’s Smart TV ecosystem has experienced enormous growth over the past year, having launched over 1,200 Smart TV apps. In addition to access to more movies and TV programs, user can access social networking services (SNS) on their LG Smart TVs, make donations to charities and even browse famous art collections. LG’s 3D Zone offers a growing collection of 3D movies and TV shows, while existing 2D movies can be converted to 3D via LG’s enhanced 3D conversion engine. Due to the use of Film Patterned Retarder (FPR) technology, LG’s 3D glasses are battery-free, lightweight and inexpensive, making them ideal for watching 3D content in large groups and comfortably for longer periods of time. And even though LG’s Smart TV ecosystem is growing in features and choices, using the TV is simpler than ever, thanks to the new Magic Remote. The new Voice Recognition mode lets users enter text — such as search terms — by making voice commands. Wheel enables users to swiftly scroll up and down various menus and apps, allowing for quicker selections. Magic Gesture makes it possible to communicate physical movements as commands. And lastly, Pointing lets users make on-screen selections quickly and easily without having to scroll or push direction keys repeatedly. The new CINEMA 3D Smart TVs offer a variety of connectivity features. The newest among them is Intel’s Wireless Display (WiDi) technology, which enables easy and quick connection between TVs and PCs without the need for cables or Internet access. Through Smart Share Plus, users can access content stored on external devices such as PCs, tablets and smartphones. Smart Share Plus also offers the Screen Share function which streams TV content to external viewing devices using a Wi-Fi connection. The quantity of content is further expanded through premium content services available through the Smart TV function. While content availability constantly grows, they remain easy to access, thanks to the upgraded Home Dashboard, which allows for quick browsing. And the shortcuts displayed on the Home Dashboard can be customized, giving users the option to handpick their favorite content and apps for instant access.